I may have mentioned once or twice on this blog that I’m focusing my sewing on my working wardrobe for the time being. 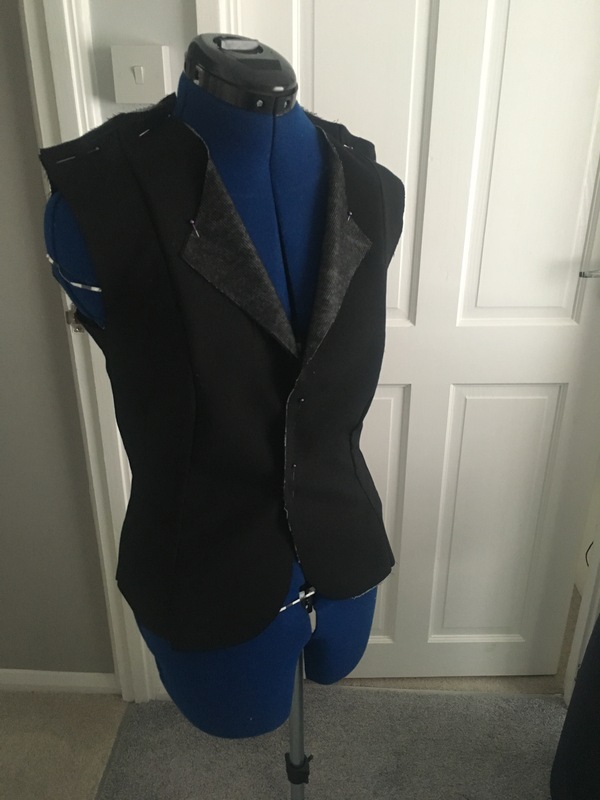 I’m really pleased to have been able to make some great blouses, skirts and trousers, and the last remaining wardrobe gap for me is a well fitted jacket. I have quite long arms, so jacket sleeves are never quite long enough, especially in my size, usually a UK 8. 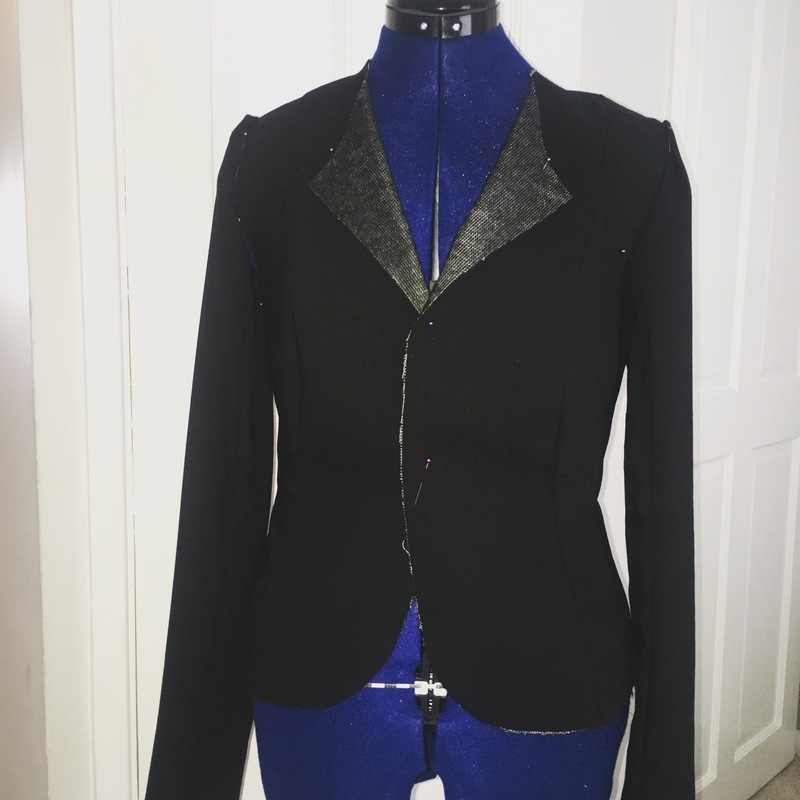 Typically I would buy a size 10 to try to get slightly longer arms, but that in turn means the shoulders are usually too big and it all looks a bit sloppy. Fortunately I’ve been able to get away with not wearing jackets often in my current job, but come September I’ll be starting an exciting new job (more on that nearer the time!) requiring an even more formal corporate dress code. 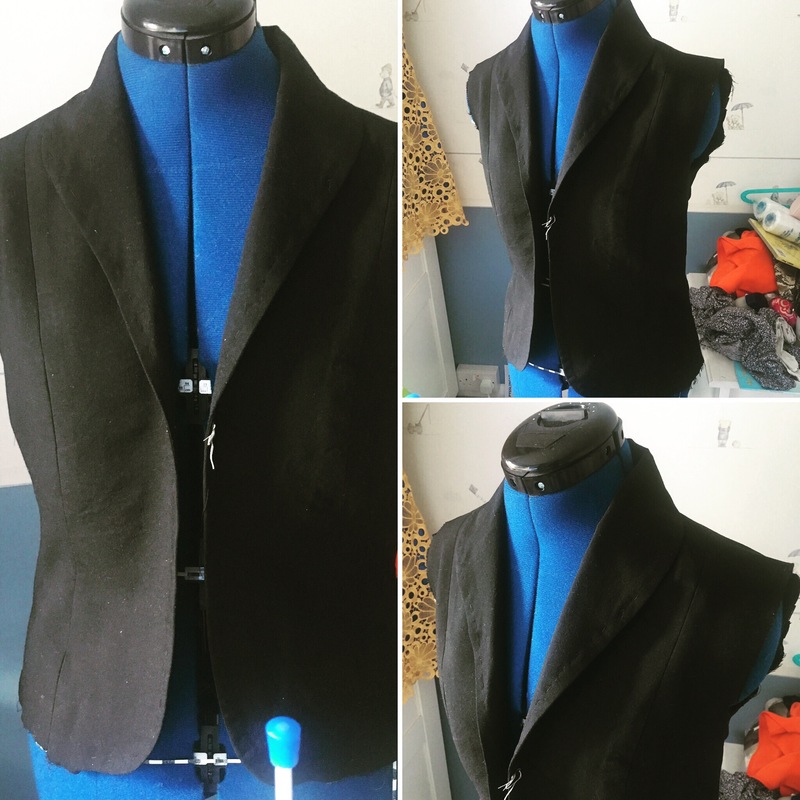 So I was keen to work my way up to making a tailored jacket! I had actually purchased a couple of patterns, like Vogue 8333, but hadn’t been brave enough to even cut a toile. Then I came across the Francine class, on Lisa Comfort’s vlog, I think, and before I could chicken out, I’d booked it! The course consists of three three-hour sessions at a Sew Over It store. Mine is being run at their Islington branch. 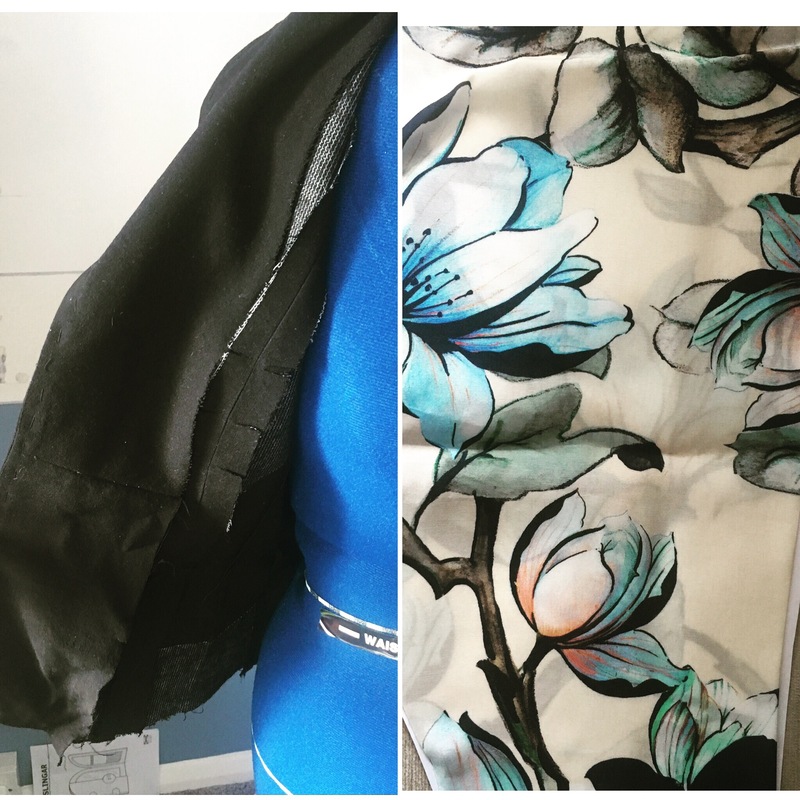 Our tutor, Julie, has many years of experience in couture and bridal houses, and it shows in how confidently and capably she dealt with questions, fittings, and any bits we got stuck on. In week one, we tried on ready-made toiles in order to confirm which pattern size we should each start from and assess the fit adjustments required. Julie checked each person’s fit and explained the alterations she would recommend, and then supervised as we each cut and amended our pattern pieces, often coming over to help transfer the adjustments from the toile to each person’s pattern. The rest of the session went pretty quickly in laying out and cutting the main fabric pieces. Our homework was to cut the interfacing, fuse it, and stitch the front, back and side pieces together. The tailoring interfacing they supplied is a thing of beauty!! After week one, this is what I had – I was naughty and even pinned the sleeves on and put it on the dress form. Julie told us in week two that we shouldn’t have tried it on at that stage because of the risk of stretching out the neckline. Oops! In week two’s lesson, we focused on pressing the seams and darts we had sewn up (lots of tips from Julie! ), attaching the collar, establishing the roll line and doing hand stitches to help “set” the roll of the collar/lapel edge seam so it’s invisible all the way round. Homework this week is to set the sleeves, and construct the lining. I think I’ll be using this floral viscose from the Fabric Godmother. My main fabric is a black suiting from Guthrie and Ghani that has a really lovely drape to it and a subtle texture. I got enough of it to make a matching skirt and trousers at some point soon. By the end of Monday’s class, the final class, I think we’ll have everything done but the buttons and buttonholes, which is quite exciting! I think I might add some patch pockets to mine but it depends whether I have enough time before class. Once the lining has been attached I know I won’t be bothered to go back in to attach the pockets cleanly behind it! I’m looking forward to the finished product and to making loads of variations! If you’re thinking about going on a course like this, I’d say go for it!! I’d love to see the results if you do! Your jacket is coming along nicely! I think the pop of feminine colours in the lining is going to make this jacket look very special indeed. I did this course last year and I am very pleased with my final jacket. I made it in a plaid which took me hours to pattern match (that on the whole it was successful). I keep meaning to make a second but I’m into sewing more summery things despite the autumnal temperatures! Thanks Caroline! I think I saw your jacket when I googled for more examples of Francine and it was one of the images that convinced me it was a good idea! Can’t imagine throwing pattern matching into the mix on this one but you did a fab job!